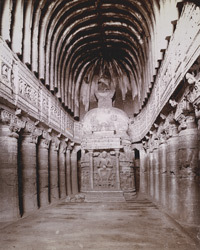 Photograph of the interior of Cave 26 at Ajanta, taken by Deen Dayal in the 1900s. The Buddhist cave temples of Ajanta were excavated into a horse-shoe shaped cliff overlooking the Waghora River in the 2nd – 1st century BC. This chaitya hall belongs to a later group from the 5th century AD. It is large and elaborately decorated. The interior of the cave has two rows of fluted columns decorated with bands of floral patterns. At the end of the central nave there is a stupa with a sculpture of a seated Buddha figure. The vault has rock-cut beams imitating wooden architecture.